<<29th October, 2018 – Hong Kong>> Home to the effortlessly stylish, unshakably polite and dangerously charismatic, Foxglove is a one-of-a-kind hidden culinary gem by Ming Fat House. 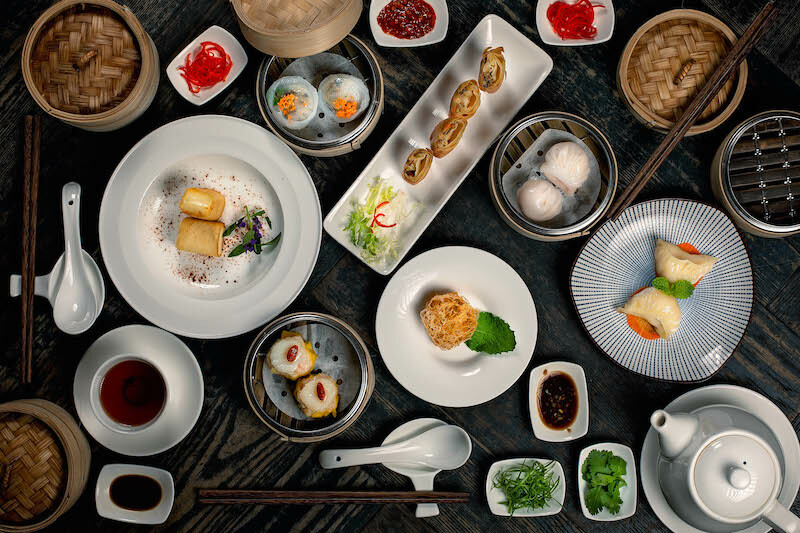 For the very first time, Foxglove is proud to present a new menu and culinary direction with a focus on traditional Cantonese cuisine, shifting away from its previous French-inspired dining experience. Under the direction of the newly appointed Head Chef Tony Hung, Foxglove’s revamped menu will provide diners a nostalgic departure from their retro-chic surroundings. Chef Tony, previously of reputed Cantonese restaurant Hoi King Heen in the Intercontinental Grand Stanford, has curated authentic Cantonese flavours, contemporary cooking methods and plating techniques he learned and mastered over the years. Frank Minza, the English mastermind behind Foxglove and a consummate jetsetter, pondered greatly for his next wanderlust foray of fine food and bold ingredients. With only a thirst for new flavours and bold experiences, he boarded his yacht and set sail for a tour around China! He journeyed to tiny villages and great cities across the coast to enrich himself in the culture, customs and native ingredients of the local villages. He tasted delectable Yue Cuisine from local street chefs, reminiscent of the time he spent with his long-lost love. 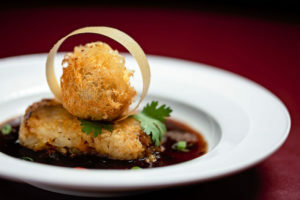 The cuisine he savored across his journey greatly inspired him to bring about a new menu of Modern Cantonese Cuisine to Foxglove, so he could share a part of his unforgettable journey with his patrons. Bringing with him over 3 decades of culinary experience, Foxglove welcomes new Executive Head Chef, Tony Hung. Originating from Guangdong, Chef Hung formerly worked at the Intercontinental Grand Stanford’s One Michelin Star Cantonese restaurant, Hoi King Heen. It was there that he discovered his own distinctive style and perfected the art of Cantonese Cuisine. 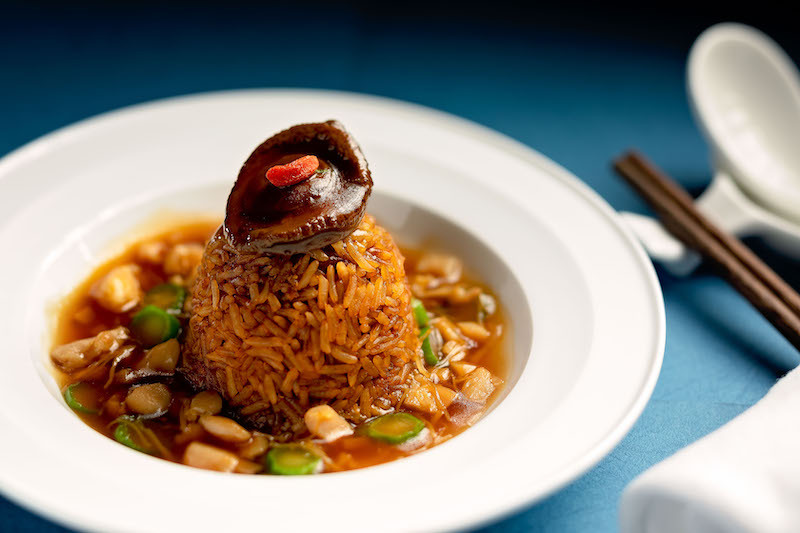 Chef Hung has created a new lunch and a la carte menu, which incorporates fresh, seasonal ingredients into traditional Cantonese Cuisine. The new a la carte menu showcases the full range of Chef Tony’s culinary skills, with sections for starters, soups, mains, rice & noodles, sweets and late-night snacks. 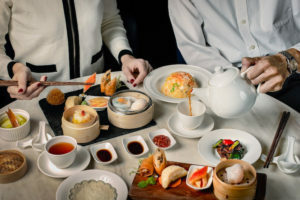 Guests may also choose from three chef’s menus, the Opulence Set (HK$498), Grand Set (HK$688) and Emperor Set (HK$928), which include seasonal Hong Kong-inspired dishes specially picked by the chef. The focus of the a la carte menu is incorporating fresh, high-quality ingredients combined with traditional Cantonese specialties. Must-try appetisers include the Crispy Whitebait Fish with Salted Egg Yolk (HK$138) and Garlic Diced Silken Tofu (HK$108). The ever-traditional double-boiled soup is created with fish maw, bamboo fungus, Chinese mushroom and vegetables, priced at HK$208 pp. TheHoney Glazed Black Cod (HK$288) is a beautiful rendition of the flaky and buttery white meat fish, and Lotus Leaf Wild Mushroom Short Ribs (HK$588) takes the enjoyment of classic short ribs to a new level. Perfect for sharing are the Braised Abalone on Diced Chicken Fried Rice (HK$98 pp) and all-vegetarian Stir-fried Egg Noodles with Soya Sauce, Chinese Chives Flower and Bean Sprout (HK$168 for regular, HK$88 for half). Finish off the meal with the chef’s signature Deep-fried Custard Milk Roll (HK$48), a classic Chinese dessert originating from the chef’s hometown in Shunde, Guangdong Province. To accompany the new all-Chinese menu, Foxglove now serves four types of distinguished organic Chinese teas. Guests can rest assured that the non-polluting, natural teas on offer are produced without artificial synthetic fertilizers, pesticides, plant growth regulars, chemical food additives and other harmful substances. Choose among a soothing selection of Aged Pu Erh, Iron Buddha (Oolong), Gwai Red Teaand Chinese Green Tea, each priced at HK$25 per person. All prices are subject to a 10% service charge. Available from Mondays to Fridays, the revamped executive lunch sets are feasts truly fit for an Emperor. Starting from HK$168 for a delectable spread of handmade dim sum delicacies, the Jade Set (HK$188) and Pearl Set (HK$218) feature chef specials and authentic Cantonese dishes such as rice & noodles, handmade dim sum and homemade authentic Cantonese desserts. The menus will change on a bi-weekly basis, so guests will always be presented with the freshest flavours of the season. Ming Fat House (MFH) was established in 2014. Our co-founders are Jonathan Bui, Shakib Pasha, and Eric Lam. MFH brings unique F&B concepts to Hong Kong with playful speakeasies and quirky restaurants. Home to Foxglove, Mrs. Pound, Frank’s Library and Dr. Fern’s Gin Parlour.